Weiland and the Wildabouts, also consists of guitarist Jeremy Brown, bassist Tommy Black and drummer Danny Thompson, aren’t a band that were formed overnight. 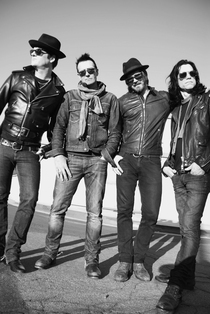 After years of jamming together, they began touring for several months in 2013 and “hunkered” down in Weiland’s Southern California studio and rehearsal space put “Blaster” together. Review Fix: How did this project come about? Scott Weiland: I’ve been jamming / touring with these guys on and off for nine years. We used to be a five piece but we decided when talking about forming a band to make it a four piece. A bigger sound with more space between the notes…the space is equally as important as the notes. Review Fix: What do you think makes this band unique? Weiland: I think that we’re unique because of the sounds that we set out to create. We wanted to find a sound before we even set out to write and record. Review Fix: All great singers go through stages in their careers. Where do you think you are now? Weiland: I’m at a whole new, exciting stage. It’s like starting from scratch. I’ve been lucky to have three stages in my career with three totally unique bands. Review Fix: How was “Modzilla” written, is there a story behind the lyrics? Weiland: Jeremy Brown, our guitar player, came in with a home demo of this song instrumentally. So we worked it out and I put the lyrics and the melody down. The lyrics are just a trip to listen to…delivered with an almost rapid fire, hip-hop like approach. But it’s not my life or my story. Who knows, maybe someone will relate to it. Review Fix: What about “Way She Moves”? It’s a little more funkier than the stuff you’re known for, but you sound comfortable vocally there. Weiland: When I heard the riff and rhythms I thought it had a T.Rex meets Love and Rockets vibe…I just rode the wave of expression. Review Fix: Who are some musicians you really appreciate that people wouldn’t expect? Review Fix: What do you think you have left to prove in music? Weiland: I’ve always got something to prove. As an artist you’ve got to stay fresh and always have a dream. Review Fix: What are your hopes for this project? Weiland: For it to be very successful and play around the world. Review Fix: What are your goals for 2015? Weiland: With everything I do…own it. Such an amazing Q&A! Weiland is a legend.